HUNTSVILLE, Ala., Jan. 23, 2019 /PRNewswire/ -- LINE-X – a global leader in powerful protective coatings, renowned spray-on bedliners and first-rate truck accessories, has been selected to provide its scientifically advanced spray-on coatings to Growler Manufacturing and Engineering for use on its combat-welding trailer titled the Mobile Tactical Welding Shop (MTWS). Growler selected LINE-X's cutting-edge polyurea coating for the highly advanced military welding trailer because it needed a coating that could perform at a high level in combat. Since the MTWS must meet a wide variety of strict U.S. military standards, the LINE-X coating includes Chemical Agent Resistant Coating (CARC). The LINE-X high-build polyurea (HBP) barrier coating meets the attribute requirements of chip, impact, wear and abrasion resistances called out in MIL-PRF-32440B. "We are very excited to be working with Growler as the exclusive polyurea coating provider for its tactical-welding trailer. Knowing it's protected by LINE-X is a huge advantage for our military," said Dennis Weese, president of LINE-X. "As a veteran myself, I understand the harsh conditions experienced on the battlefield, and I am confident that Growler made the right choice by trusting LINE-X to help protect the equipment relied upon by our service members. 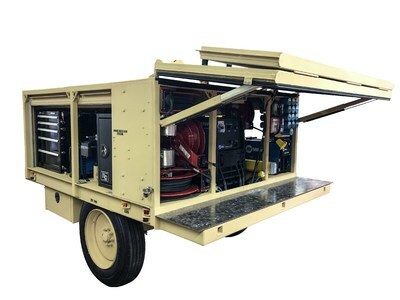 LINE-X is already trusted by the military in many different applications, and we are excited to add the mobile-welding trailer to that growing list." "With protection, coating durability and extended lifecycle in mind, we needed a product that could outperform typical coatings. After evaluating several different options, nothing performed as well as LINE-X, so we quickly determined it was right choice for this project," said John Crews, president of Growler Manufacturing and Engineering.